(CNN) -- The images of Neda Agha Soltan's death on the streets of Tehran transformed her into an icon for Iran's opposition movement. But very few know of Ramin Ramezani, who was killed five days before Neda during last year's post-election demonstrations in the Iranian capital. "I always say Neda is the miracle of the century," Ramin's mother Zahra Ramezani told CNN by phone. "Neda was destined to be known to everyone. If Ramin isn't known to everyone, that's OK."
Iranian President Mahmoud Ahmadinejad's landslide re-election on June 12, 2009, had sparked the biggest protests in Iran since the 1979 revolution. Ramin was on leave from military duty, back in Tehran to celebrate his 22nd birthday, just six days away. His parents told CNN that he had voted for Mir Hossein Moussavi, the opposition candidate who had energized young Iranians with promises of a freer society, more rights for women, and better relations with the West. 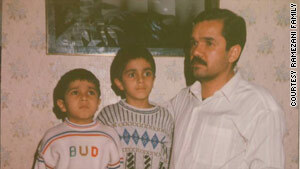 Ramin, pictured in the center of this undated family photo, was one of the first demonstrators killed during the June 2009 protests. Around 6 p.m. that day, Ramin called his parents and told them not to worry, they said. He said he'd be home later that evening. An hour later, just blocks away from Azadi square, violence erupted at a base for the Basij, Iran's pro-government militia. Protesters surrounded the building, shattered its windows with rocks, and set fire to several rooms. Amateur video from the scene showed several armed members of the Basij on the rooftop apparently firing shots. It was here, Ramin's parents said, that their son was killed. A single bullet entered the right side of his chest, tore through both his lungs and killed him within minutes, his parents said. There was no way to know who fired the shot. It is widely believed that Ramin and several others who were killed on June 15 were the first casualties of the opposition movement's protests. When Ramin didn't show up at home, the Ramezanis stayed up all night trying to reach him. Zahra Ramezani said she called Ramin's cell phone every hour but no one answered. As soon as he said 'remains' there was chaos in our home. The following day they received a brief call from a man who did not identify himself. "He said, 'If you want your son's remains,' and as soon as he said 'remains' there was chaos in our home," said Zahra Ramezani. "We were all hitting ourselves, screaming and shouting." For Ramin's parents the nightmare was just beginning. Over the course of a week, they said they searched for Ramin's remains in five hospitals. They pleaded with officials at two courthouses and the interior ministry to help them find their son's body. Authorities said they would investigate. Finally, at a prison morgue, a prison official showed Ramin's father the picture of his son's remains on a computer screen. "For about one hour I lost myself," Mehdi Ramezani said. "I was hitting myself in the face and the head, asking, 'Why is my son's naked remains on this monitor?'" Mehdi Ramezani said an official at the prison morgue warned him to keep quiet about his son's death. "They made me promise them not to cause a big commotion during his funeral," Mehdi Ramezani said. "They said it wouldn't be good for your future and the future of your children." Calls to Iran's judiciary and security officials seeking comment were not returned. 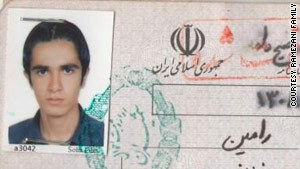 A passport image of Ramin Ramezani, whose parents say they just want his killers to be punished. Until now, Zahra and Mehdi Ramezani have never spoken to the international media. But after keeping silent for more than nine months, they still don't know any more about how their son died. "They still haven't told us anything," Zahra Ramezani said. "They said, 'We didn't shoot him.' Then who shot him?" Human rights groups say around 80 people were killed during Iran's 2009 post-election protests, while Iran's government puts the number at about half of that. While Iran has charged prison officials with torturing to death some of those detained after the demonstrations, no one has been charged in any of the deaths during the protests. Authorities in Iran have told CNN they are investigating the deaths, but the Ramezanis say they are losing hope. Every Friday morning the Ramezanis visit Tehran's main cemetery where their son's gravesite sits just steps away from Neda Agha Soltan's. Ramin's parents say they don't want the attention Neda is getting. All they want is someone to tell them who killed these two young Iranians and why. "A good and ideal government is for everyone, even those who oppose it," said Zahra Ramezani. "If they consider themselves servants of Iran, then they owe us something."